Single-family house "Villa Mare", 2 storeys, built in 2018. In the hamlet Raštane Donje 4 km from the centre of Sv. Filip i Jakov, 14 km from the centre of Biograd na Moru, in a quiet, sunny position, 4 km from the sea, 4 km from the beach. 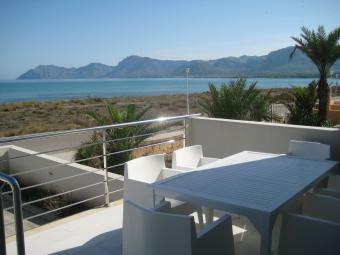 Private: property 800 m2 (fenced), swimming pool angular (8 x 4 m, depth 140 cm, 28.04.-29.09.). Outdoor shower, whirlpool, garden furniture, barbecue. In the house: internet access. Parking (for 2 cars) at the house on the premises. Shop 2 km, restaurant 4 km, pebble beach 4 km. 4-room house 125 m2 on 2 levels, south-west facing position. Living/dining room 45 m2 with satellite TV (flat screen), air conditioning. Exit to the terrace. 1 room with 1 french bed (160 cm, length 200 cm). Open kitchen (4 hot plates, oven, dishwasher, microwave, freezer). Shower/WC, sep. WC. Top floor: (spiral staircase), 2 rooms with sloping ceilings, ceiling height 150 - 250 cm, each room with 1 french bed (160 cm, length 200 cm), shower/WC and air conditioning. Terrace 45 m2, roofed. Terrace furniture, deck chairs. View of the swimming pool. Facilities: baby cot (extra). Internet (WiFi, free). 1 pet/ dog allowed.